It's been hard to sit down and write about my Prague journey so far. It's been hard for two reasons. The first one being that my time alone is extremely limited these days. Getting a TEFL certification in a month is not for the lazy, and if you are lazy and arrive here with that mentality, I can assure you that you will quickly change your ways or you will probably be packing your bags sooner than you thought. Nonetheless, I truly just have not had a lot of time to sit down and write. I am in class all day, and after class ends, I lesson plan or apartment search, or some weird combination of the two. The other reason is because, no matter how much I love writing, it is really difficult to put into words what this first month of living abroad has been like. I'm going to try though. The day I left Atlanta was hard. It was really hard. I wasn't expecting to be so emotional, but my tear ducts were going nuts and I cried like a baby saying bye to my little sister, my parents, my dog, and my grandparents. There was nothing easy about it, and their loving support made it that much harder. Alas, I got to the airport, hugged my parents goodbye, and walked through security. I was lucky enough to have a moment of checking in with my purpose of doing this adventure when one of my sorority sisters wanted to chat on the phone about the program I was doing and my reasoning for pursuing this crazy idea. I sat at my gate, much calmer than earlier in the day when I was crying and hugging my dog in my living room, talking to AJ (my sorority sister) on the phone, explaining why I was truly doing this and what got me to the point where I was sitting at the gate for a flight to Munich. And that was what I needed. I boarded my flight, and because I fly standby, I was lucky enough to get upgraded to business class. Now, let's fast forward a bit. I arrived in Prague on Saturday, August 5th. I walked into my living space for the month and here I found a small room with one window, red carpet, a tiny bed, and zero air conditioning. And it was ninety degrees outside. But it was okay. I was so happy to be there. I took myself to the store, bought a fan, and went on with my evening. Our TEFL course began that following Monday. Immediately there was so much information thrown at us. We found out that we would be teaching our first lesson to real students the very next day. Yes, you read that right. I taught actual Czech students on day two. The next lesson we taught was Thursday, and that one was for a grade. We have to pass 5/6 lessons we teach, so being thrown into a classroom on the fourth day while being graded on a number of components was unbelievably intimidating. But once again, it was good. It was what I needed. The two weeks that followed were intense. I was up until 1AM lesson planning most nights after a full day in class and a full day to come the next day. I was eating primarily pasta or salad (ask my mom more about this, she was growing to be extremely concerned about my eating habits). Altogether, it was a lot. But I made friends. And I became extremely comfortable teaching; and not only teaching, but also planning any type of lesson. From grammar, to reading, to writing, to listening - I now feel proficient to do any of it. A LOT of adventures have already happened since moving here. For more on those, follow my blog (@hungrysouthernyogi) Instagram. This post would be a novel if I were to write about each day since arriving. It is now Sunday, August 27th. Tomorrow begins my last week of the course. Last night, a new friend and I adventured through the city and stumbled upon way too many cheap cocktails. We ended up having such a purely fun night. I realized last night, while the two of us were gallavanting through the city, that for the first time in my life, I feel so independent. Over dinner we talked about how cool it is that we are actually doing this. We are living here. And throughout the night, we were making decisions based on exactly what we felt like doing. There was no outside pressure. We were going in and out of whichever bars we felt like, talking to locals, and truly enjoying each moment. I don't know why this felt so new to me, but it did. I keep trying to think of a different word to describe my feelings these days, but independence is the only one that gives any true perspective. So, that's where I am. I am independently living in Central Europe. Hanging out with new folks, living in the same time zone as my boyfriend, eating good food, living far away from the comfort of home, and being challenged in ways that I have never been challenged before. I have come to recognize that in the moments after I achieve something in Prague, I feel invincible. Lately these moments have stemmed from officially saying yes to an apartment. These moments have been after I successfully taught my first one-on-one lesson. These moments are after I get feedback from a lesson I didn't feel I did too well on, and then the feedback only being positive. These moments are small moments, dispursed through the days, lost in the weeks, sometimes forgotten about by the weekends, but these moments are powerful. Teaching abroad is not something I ever saw myself doing. But teaching abroad is teaching me lessons everyday. It's showing me the true feeling of independence. 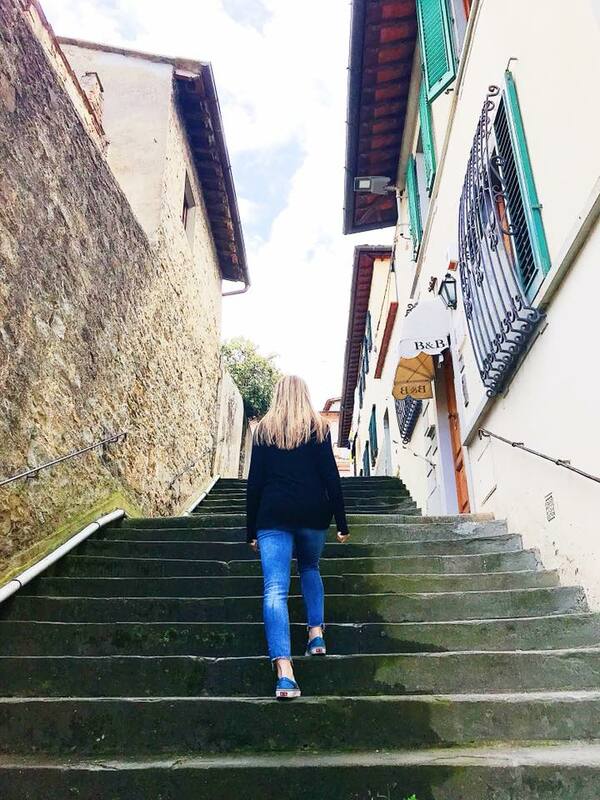 It's introducing me to the scary world of adulthood, but with a twist: doing all of it abroad where the culture and the language are fiercely different from what I am accustomed to. This has forced my comfort level to stretch, and everyone needs a stretch in comfort level every once in a while. Tomorrow begins the most intense week of the course. On top of the many assignments due, the exams that need to be passed, and the lessons that must be successful, my roommate and I will officially be signing our lease this week, I will be searching for a job, and on Saturday my boyfriend and I are meeting some friends from back home in Brussels (YAY!). Life over here is amazing. It really is. It humbles me daily, but it also builds me up in ways that I never realized I needed. I'm so happy with my decision to move here. I am ready to wake up in the coming days, ready to find comfort in being uncomfortable. If living abroad has ever crossed your mind but you make up excuses not to do it, I say: Stop it. Stop it right now. You can do it. It's not hard. It's everything you never thought you needed. Find a way to come over here, and do it immediately. Life is short. You are ready for this. I promise.